Rabbi at Emden and one of the founders of the Spanish-Portuguese community at Amsterdam; born 1544, probably at Wittmund; died after 1622 in Emden. In 1593 a vessel of Maranos, under the leadership of Jacob Tirado, was driven out of its course to Emden, and Tirado, seeing from a Hebrew inscription on a house that Jews lived in the city, found his way to the home of Moses Uri ha-Levi. Tirado explained who he was and requested that he and his companions be received into Judaism. Moses Uri advised him to go to Amsterdam, and promised to follow with his family. 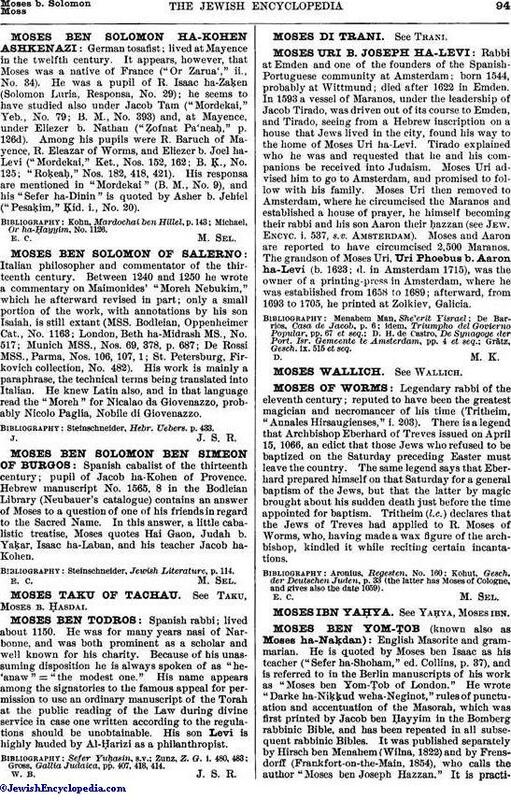 Moses Uri then removed to Amsterdam, where he circumcised the Maranos and established a house of prayer, he himself becoming their rabbi and his son Aaron their ḥazzan (see Jew. Encyc. i. 537, s.v. Amsterdam). Moses and Aaron are reported to have circumcised 2,500 Maranos. The grandson of Moses Uri, Uri Phoebus b. Aaron ha-Levi (b. 1623; d. in Amsterdam 1715), was the owner of a printing-press in Amsterdam, where he was established from 1658 to 1689; afterward, from 1693 to 1705, he printed at Zolkiev, Galicia. Grätz, Gesch. ix. 515 et seq.